We all had strange monsters we were warned about when we were kids. For some reason, my parents chose to scare the living daylights out of me by talking about "The Scary Scarecrow" (some years before Worzel Gummidge hit TV screens) and I've never quite got over it. 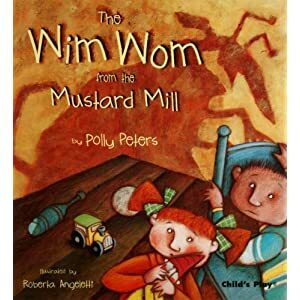 In "The Wim Wom from the Mustard Mill", two children find out that seemingly everyone knows about the mysterious Wim Wom - except for them. The more they try to understand what a Wim Wom is, the more fantastical tales they're spun by the adults in the book - until the tables are deliciously overturned at the end. Great storytelling and Roberta Angeletti's artwork is just the right side of "not too menacing" for your little ones, but adds to the fantastic atmosphere the book generates. Might be a bit scary for younger kids but great for inquiring minds. 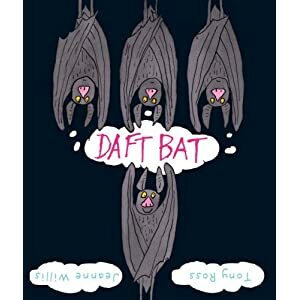 A topsy-turvy view of the world from the perspective of a bat is the subject of "Daft Bat", an entertaining children's book by Jeanne Wills and Tony "Little Princess" Ross. All the other animals can't understand Bat's rather bonkers approach to her surroundings but is she crazy or just seeing things differently? Wise owl helps sort out the confusion and mess and soon everyone understands exactly what "Daft Bat" is on about. Charlotte's best bit: Elephant almost drowning upside down. Daddy's favourite bit: Saying "Daft Bat" in a broad Yorkshire accent. Very few authors seem to be able to get inside a cat's head to any degree of success. 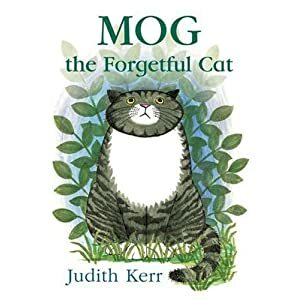 Akif Pirinici managed it with his grown-up "Felidae" books, and Judith Kerr has also managed it with this timeless children's classic, "Mog the Forgetful Cat". Telling the story of a simple ordinary family house cat, the way the story is told immediately 'clicks' with anyone who's ever owned a cat. From forgetting they've been fed (a frequent occurrence when we owned cats) to basically being in the wrong place at the wrong time, Mog is a typical moggy but she's lovable and brave. If you've never encountered the Mog books (those of you of a certain age probably remember them from school as they were first published in 1975) they're absolutely brilliant and definitely up there with the likes of "The Very Hungry Caterpillar" and "We're going on a Bear Hunt". Thoroughly recommended. Charlotte's best bit: "Bother that cat, bother bother that cat!" Daddy's favourite bit: The fact that even the burglar gets a cup of tea (while being arrested). Olly Bear has a new baby sister, and like all children suddenly faced with a younger sibling, Olly's not too sure what to make of the new arrival. Olly pretends to take no notice of his adorable baby sister at first, but soon Olly learns that she's lovable, playful and loves her big brother very much. 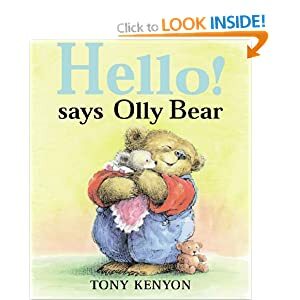 A very cute little story that will definitely have plenty of familiarity for parents who've just had a second child, and toddlers who have someone else in the house that suddenly becomes the centre of attention. Charlotte's best bit: Olly's baby sister cries, and cries, and cries. Daddy's favourite bit: Definitely identifying with Olly's parents who are spark out by 8 o clock at night. 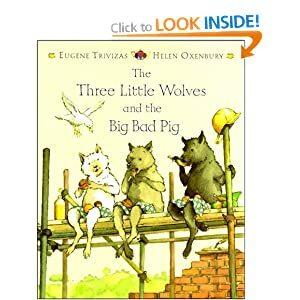 A novel twist on the well known and well loved children's classic, turning the tables and setting three cuddly fluffy little wolves against a big, bad and extremely destructive pig. Helen Oxenbury's illustrations are beautifully drawn and the story may feel familiar but the novel little changes and twists are excellent fun, particularly if your child already knows the original story of the three little pigs and their houses of straw, sticks and bricks. Who knew that wolves could be such excellent builders and that pigs had access to dynamite! Charlotte's best bit: The wolves getting their tails singed. Daddy's favourite bit: The armour plated house with its own entry phone and CCTV. 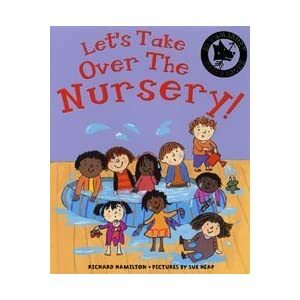 Let's take over the Nursery! This must be every pre-schooler's ultimate fantasy, surely? What would they do if the teacher got stuck in a climbing frame for the day? Not quite Lord of the Flies but certainly chaos ensues when just such an occurrence happens, and the children decide to do exactly what they want all day. Great rhyming text lays out the story of the gradual descent into toddler chaos, with the poor Nursery teacher powerless to step in. 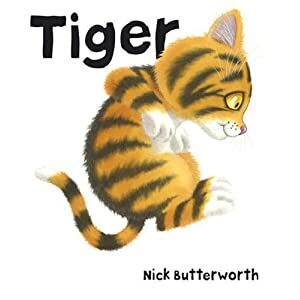 Naturally the children soon realise that taking over the nursery for the day isn't quite as great as it sounds but there's a great conclusion to the story and with Sue Heap's child-like but detailed illustrations underpinning the rhyming couplets here, this is a super little story. Charlotte's best bit: Millie sitting on Lily, and Tilly sitting on Millie. Daddy's favourite bit: The kids going crazy with paints. 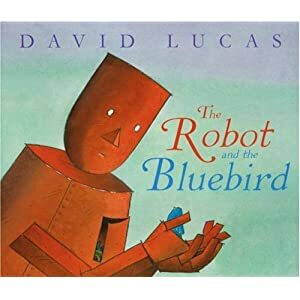 A superb and touching book, The Robot and the Bluebird mixes simple but extremely effective illustrations with a heartfelt story of a robot with a broken heart, feeling that his place in the world is on a scrap heap until he finds he is needed by a lost and lonely bluebird, struggling to migrate for the winter. If you're a hard-hearted type, you might not find it as emotionally engaging as a big old softy like me, but the end is beautiful and Charlotte loved the main characters. A lovely little parable beautifully told and wonderfully illustrated. Daddy's favourite bit: The excellent illustration style. Quite unique but really well drawn. Once again, a Red Fox-published book has ended up being a bit of a cracker - literally in this case. The story of an impatient egg that wants to fly is quirky and touching at the same time, and the egg's plight is underpinned by great illustrations from Mini Grey. High concept children's books are something of a rarity, mostly because what parents don't want to see in a children's book is a lot of semi-political symbolism telling them how bleak the world is and how little hope there is that it'll all be alright in the end. The very last thing children want to see in a children's book is a lot of dark imagery that is hard to describe or relate to. So Varmints: Part One is an oddity. On one hand, it has some delicious little moments of cuteness but on the other hand it's wrapped up in such dark colours and with such a sombre thread running through it that even the glimmer of hope at the end of this first episode (with no sign of Episode 2 or 3 seen yet), this book borders on the unapproachable. It's not helped by extremely dark text that merges with the dark painted illustrations, and is extremely difficult to pick out if, like me, you read books to your child at night with nothing but a night light on hand to light up the pages. Varmints: Part One is definitely for an older audience (though it was in the young children's book section of our library, probably by mistake) and if you've ever played the PS3 game "Flower" you might think it all feels extremely familiar too. Daddy's favourite bit: The fact that it reminded me of Flower. Peppa Pig seems to have been around in one form or another for absolutely ages (and in fact this book was first published in 2003). We're relative latecomers to the Peppa Pig phenomenon. Charlotte loves the TV series because it's completely insane, surreal and...well...piggy. I love it because it features a lot of alumni from the "Absolutely" team, a bunch of talented comedians featuring the likes of Morwenna Banks, John Sparkes and Pete Baikie. 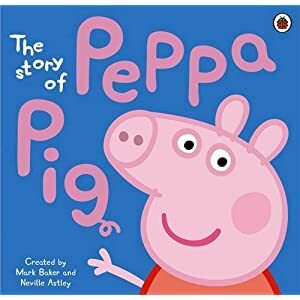 The Story of Peppa Pig contains all the essential ingredients kids would require from a Peppa Pig book. Instructions on how to jump in muddy puddles, George's complete love of Dine-Saws (Grr), Daddy Pig's ineptitude at everything, and Mummy Pig's wisdom as well as Peppa's muddy puddle obsession. Certainly better than most books licensed from TV series and an absolute must if your child is a fan of "The Hair Dryers" as one of my friends calls Peppa and her family. A strange circular book that is instantly eye catching, which was why Charlotte latched onto this at the Library and wouldn't let it go. The squirty squelchy aliens inside are a motley bunch of nefarious extra-terrestrials who are intent on enslaving mankind. Only you can stop them - literally! The book's eye catching artwork continues inside, with all manner of alien beasties lining up to strut their funky stuff. 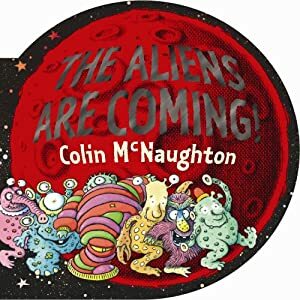 McNaughton's bold and colourful illustrations are slightly gross and icky but let's face it, kids love that stuff so they will absolutely love this book. 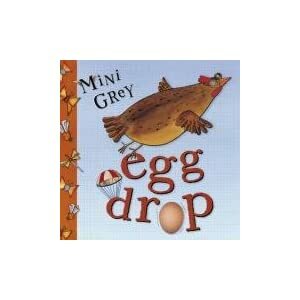 Bouncing rhymes and a superb pay-off at the end make this a great little read for you and your children. Doesn't everyone want to be a tiger? This little kitten certainly does in this amusing "Reality vs Fantasy" tale of a kitty with a tiny superiority complex. Lovely rich and sumptuous painted artwork is the order of the day here, with a kitten character (and tiger counterpart) that your children would just love to snuggle up to and cuddle. The mischievous central character lets his imagination run wild as he stalks through the back garden, pretending it's the deepest darkest jungle. 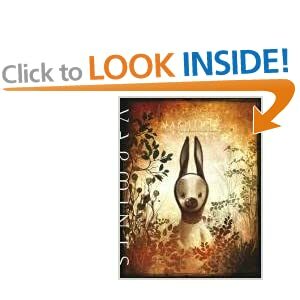 Great eye-catching cover that compliments the illustrations inside perfectly. Daddy's favourite bit: The tiny miaow of the kitten. Very cute. At home, there are two books that still survive from my childhood - which I've kept from the age Charlotte is now. One is a Tale of two Dormice which is a pretty unremarkable tome, but the other is an extremely battered and well worn copy of "The Tale of Hunky Dory" by Racey Helps. Though there are pages missing, and despite fruitless searches for a replacement, I've still kept it simply because Angus Clifford Racey Helps (they don't make names like that any more!) was an absolutely electrifying storyteller and illustrator. "The Tale of Hunky Dory" was first published by Collins in 1958 so it would've been ten or so years later when I was given a copy as a baby. Naturally when you're a baby, the only thing you want to do with books is eat them so over the years the book got extremely mauled, and bits got lost in various house moves - but one thing that has stayed constant is just how utterly skilled Helps was. As with the previously covered books in the Blackberry Farm series, Helps books feature a range of animal characters with human characteristics - though the characters in Hunky Dory owe a great deal to the likes of Kenneth Grahame and the Wind in the Willows books rather than Beatrix Potter. "The Tale of Hunky Dory" follows the tale of the titular dormouse and his adventures as he prepares for a long winter in hibernation. Due to a mix up, Hunky Dory loses his favourite blanket to a rather adventurous and inquisitive shrew who is obsessed with all things nautical. The two finally bump into each other just as Hunky Dory has purloined Shrew's bed as a boat. Eventually they embark on a water-borne adventure that sees them narrowly escaping the jaws of a nasty pike. The painted illustrations are achingly good in this, and it has broad appeal right through the generations as it's now one of Charlotte's favourite books (even though I have to use my addled memory to fill in the pages that are missing). Amazon seems to have a few used copies of Helps books if you click through the link at the top of this review. They're excellent and if you ever spot a copy of "The Tale of Hunky Dory" and don't mind parting with it, get in touch! 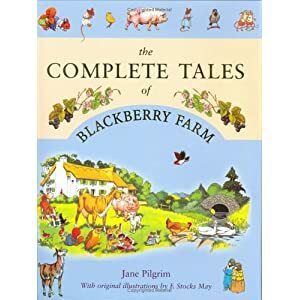 It seems a bit sad to think that the Blackberry Farm books have recently gone out of print, though there are a few up for grabs via various Amazon resellers. First published in 1950, Jane Pilgrim's books with superb illustrations by F. Stocks May, introduced a fantastic cast of animals and a Beatrix-Potter-Esque world of anthropomorphic animal antics. 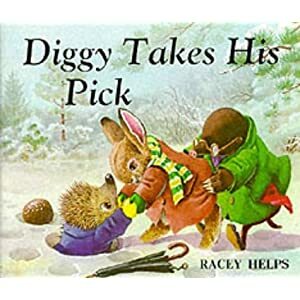 The books were originally printed as a series of paperback "flimsies", selling for pocket money prices and reprinted various times right up until (at least) 2005 by various publishers. Anthology collections of the stories were also produced (including the one pictured at the top of this review, which gathers together most of the 24 stories in one large and satisfying volume. Getting hold of the anthology version is difficult but if you ever spot this on your travels, or nestling in the corner of a secondhand bookshop, grab it as the stories may be old but they're cute and definitely something your toddler will love. Okay, okay I'll admit it. I've got a massive crush on Melanie Watt and I really like her sense of humour. 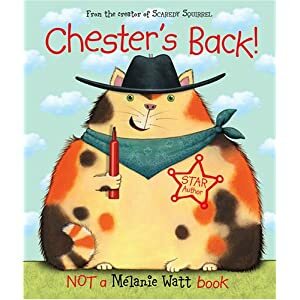 The Scaredy Squirrel "Self Help" books for nervous squirrel types are excellent, but ahh Melanie, what on earth is going on in the Chester books? The sassy cat demands star billing and proceeds to turn Mel's book into a disaster. She does exact her revenge in the end but you know Chester will have the last laugh. Not as immediately accessible for youngsters as the Scaredy Squirrel books but a great and original idea. Charlotte's best bit: Seeing what Melanie Watt does to Chester to get her own back. Daddy's favourite bit: Lovely pics of Melanie Watt. Sigh. An abandoned house, a creepy setting for a children's tale but this charming story of a mouse making his way back "home" is enchanting and absolutely beautifully illustrated. 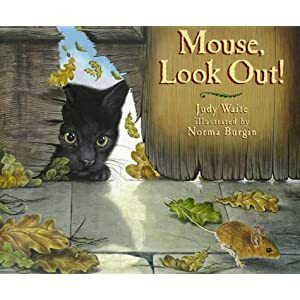 On every page, secretive eyes watch the mouse's every movement and finding these eyes / finding the shadows of the stalking cat are all part of the fun. A great twist in the tale at the end too! If you're anything like me, and are a fan of those urban exploration blogs where photographers find their way into abandoned buildings and take pictures of the human detritus left behind, then this will definitely appeal. For children who like their slightly spooky stuff to have a neat payoff at the end, it's a winner. Charlotte's best bit: Finding the various sets of eyes in each picture. Daddy's favourite bit: Where the mouse makes his nest. Try as I might to avoid bringing home Monster books from the library, there are so many. When Charlotte picked this book out and clung to it for dear life, no amount of cajoling or persuading could convince her to leave it behind. 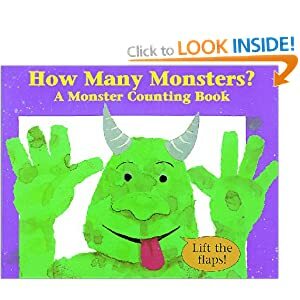 The good news is that the monsters in this book are a happy jolly bunch and there are plenty of "lift the flap" pages to keep youngsters occupied (though here's an open question to publishers and authors - why do lift the flap books invarlably not have a lift-flap on the very last page of the book? We've seen that quite a few times). A couple of moments of concern occured when the book talks about monsters hiding under the bed (do other parents have a toddler who's convinced that this is where monsters live even if you take every measure to convince them otherwise?) and another monster talking about eating little boys - but the pace and mood of the book is light hearted and jocular enough to gloss over these bits. Daddy's favourite bit: Monsters bothering grannies! It's a hot lazy summer and Winnie the Witch is fed up with lounging around in her garden at home. She gathers up her broomstick, and Wilbur, and heads to the coast for an action packed day out. As ever, just when we think we've read all the Winnie Witch books, another one pops up and they're always a welcome addition to our weekly library run. 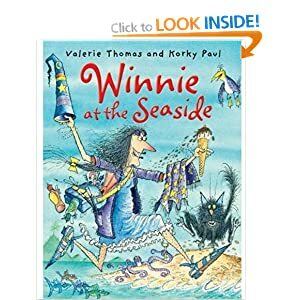 Spotting cameos from other Korky Paul books is always half the fun of a Winnie Witch story so look forward to spotting The Fish who could Wish in there amongst others. Secretly though, Charlotte is beginning to wish that Valerie Thomas would write a book that just had Wilbur in it. Might be worth an email? Charlotte's best bit: "Doctor Lady!" (Professor Puffendorf, who also makes a cameo wearing a rather fetching lime green bathing suit). Daddy's favourite bit: Noting that even witches have cellulite! This is a very strange book and coming at it without knowing about its prequel, "The Cow that Laid an Egg" was probably not the best way round to do things, but Charlotte's eye was caught by the bold and zany illustrations so we ended up taking this home. Marjorie the Cow has a daughter named Daisy. 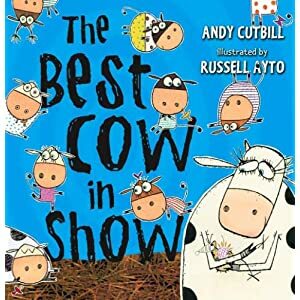 Most cows' offspring are, well, they're cows but Daisy is incredibly special as you'll find out during the course of this book. It's a madcap "Cutest Baby Cow" competition that brings matters to a head down at the farm, and with Derek the Handsome Bull on hand to oversee proceedings, Marjorie's life certainly gets a lot more interesting as a result. Russell Ayto's illustrations are excellent, like an insane cross between a Polish cartoon series and Ren and Stimpy. I love my daughter to bits, but she's got a way with words already (which I'm sure she inherited from her mum). "You've got cobwebs up your nose, daddy!" Bless her. 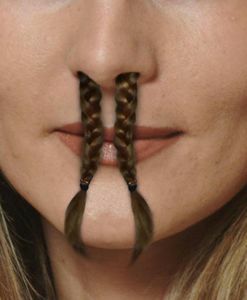 I think a set of nose hair trimmers for christmas may be in order. Ung.